There are always new things to try in the garden in the quest for more harvest with less effort, and anything that saves a little time, increases success, or saves money is worth considering. Turn a long-handled tool, such as a hoe or a garden fork, into a measuring stick. Lay the tool on the ground and place a tape measure next to it. Using a permanent marker, write measurement marks on the handle. Then, when you need to space plants a certain distance apart, you'll already have a measuring device in your hand. Rejuvenate old plastic labels by rubbing them with sandpaper. Permanent marker will be rubbed away quite easily, and you’ll get several years use out of them. Or, why not make your own labels. Used, clean yoghurt pots can be cut into strips to make several labels from one pot; old broken roof tiles make attractive markers labelled with white paint; or, for a more natural look, smooth flat stones of various sizes can be written on with paint or permanent marker, and can be placed unobtrusively at the base of your plants and reused each year. If you’re all out of cloches and there’s a late frost forecast, use terracotta plant pots instead. Turn them upside-down and pop one over your precious seedlings. It’ll act as a warm jacket against a light frost. Don’t forget to remove it in the morning so your plant can get the light it needs to grow. If you garden organically, the chances are that come aphid season you’ll have them infest your plants. Many gardeners tackle this by squishing the tiny insects with their fingers, but it’s a messy job. You could try blasting them off with jets of water, but this is time consuming and uses a lot of water. Instead, try using sticky tape. Wrap a wide strip of tape around your hand, sticky side out, and pat the leaves of plants infested with aphids. Concentrate on the undersides of leaves, because that's where they like to hide. Alternatively, incorporating plants that aphids love (such as nasturtiums) into your garden will lure them away from your main crops. Include companion planting flowers to attract beneficial insects which will eat aphids and other pests. If you live in a hot area or have a particularly sunny spot in your garden, you might find that thirsty plants like cucumbers and tomatoes dry out quickly without irrigation, reducing the crop or quality. Make water reservoirs out of plastic water bottles to keep your plants hydrated. Drill a few small holes into the cap to allow water to percolate out, and cut the bottom off the bottle. Sink the up-turned bottle into the pot or ground before planting, leaving about an inch poking above the layer of soil. Keep the bottle filled and the plant roots will absorb the water as it’s required. Reduce your water bill by reusing water from your kitchen. 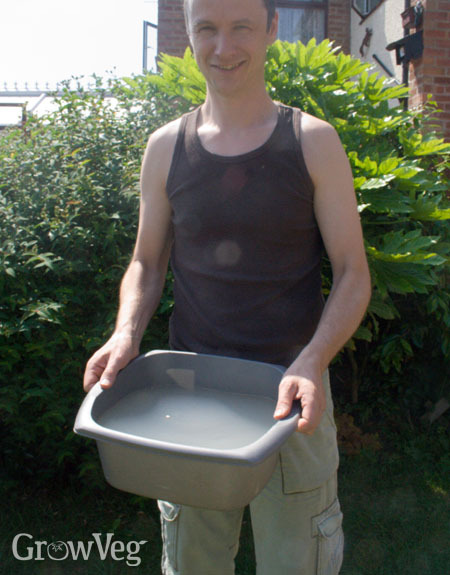 Save the water from boiled veggies and once it has cooled, use it to water your garden or your pots. If you use a plant-based dish washing detergent, this water too can be used on your garden. Don’t use it if you’ve washed pots with lots of dairy or meat, as you don’t want these products in your soil. You could use bath water too, but it could take a long time! Some seeds, like peas and sweet peas, have a hard coating. Once planted out, it takes a while for this coating to break down, and for germination to begin. Get a head start by soaking the seed you’ll use in lukewarm water overnight, then plant out as usual. Make sure the ground is warm enough though, otherwise your seeds will likely rot. Some vegetables like beans and peas don’t like to have their roots disturbed, so conventional wisdom is to plant them in situ, and not to transplant out. This has some problems, as seeds can rot in cool soil. 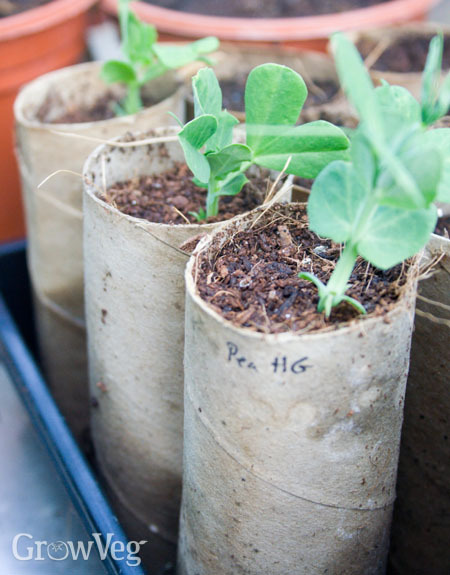 Bypass this by making your own pea and bean planters from cardboard tubes. Take a tube and make three cuts about a third of the way along the tube to make flaps. Push the flaps into the centre, and press to keep in place. Fill with potting soil and sow seeds as usual. Store the tubes in a tray, to prevent the flaps from failing. When ready for planting out, plant the seedling and tube as one – the cardboard will rot, and your seedling’s roots will find their way out. If you’re running out of space in your garden, go vertical. There are many varieties of vegetables which will climb or trail, and you can make vertical planters for them which can be fixed to walls or fences. One option is to use guttering, cut to length. Drill small holes along the length to allow water to drain out, install the end caps and recommended brackets, and clip the guttering in place. Add a moisture retentive growing medium and plant up with plants such as strawberries or salads that don’t mind the shallow soil. Keep your guttering planters watered, or install drip irrigation. Use garden planning software to help plan what you’re going to grow, and where. Good planning reduces the risk of losing plants by sowing at the wrong time, spacing them incorrectly or forgetting to rotate crops to reduce the likelihood of soil-borne pests and diseases from one year to the next. It will also help you to plan succession planting, so you can quickly see where gaps will appear and have plants ready to fill those gaps, making sure you get as much food as possible from your space. What’s your top gardening hack? Share it with us by leaving a comment below. "I have trouble with my tomato,s. The leave tend to go brow from the bottom up .the tomatoes don,t get to their right size. The leaves get brown spots at the under side of the leaves....,"
"I use water retaining gel crystals in my planters. Sometimes they are to slow to swell and are too big. Once swollen. To reduce the size and time they take to swell I use my liquidiser to reduce their size dry or in water. It works a treat. Remember to wash out liquidiser well "